A Regular pool service regime is a must for any pool. Without the correct maintenance and regular cleaning, a pool will turn into a green nightmare through equipment failure and poor water balance. The cost of pool clean ups can run into thousands of dollars in some cases, and so preventing such a disaster through regular servicing is a no-brainer. And so begs the question… How often is pool servicing required? The answer to this question really depends on numerous factors, many of which are discussed in this article. We recommend a visual inspection of the pool is performed daily. check pool water is clean and clear of debris or other contaminants – poor water clarity is a sure indicator that the pool is at risk of algae infestation. ensure water level or capacity is suitable for operation and swimmer usage – if a pools water level is not maintained equipment failure and major damage may occur. inspect the operating equipment while functioning – This will often indicate if any performance issues are present, and can provide key water quality info. ensure the auto-cleaning equipment is adapted and functioning correctly (if applicable) – if a cleaner is not working properly it may cause failure or damage to equipment. clean out skimmer and filtering baskets – if a high amount of litter regularly enters the pool or a high bather load is present this may be a requirement. remove any litter, vegetation or objects which have entered pool – objects and litter can restrict operation, cause staining and allow for algae infestation. check safety barriers/fencing climbable zones have not been breached by objects and entry gates are secure and self-closing – diligence in maintaining safety compliance may just save a life. After completing all checks, follow up on any issues noted and address them immediately to prevent pool problems. Pool Clear provides weekly servicing, this regular pool service is often needed by clients unable to attend to weekly pool duties, pools receiving high bather loads, increased litter or have other water quality and workplace requirements. A weekly service of a pool is generally needed to remove contaminants and should be integrated with the daily maintenance regime. Following the visual inspection, clean the skimmer and pump baskets if required and manually remove any litter possible with a leaf net. Brush pool surfaces and manually vacuum the pool floor and steps via the skimmer box or suction port, or with a robotic pool cleaner. Weekly water testing may be a requirement, typically analysis of chlorine (or sanitizer), pH & salt levels a minimum. Further equipment servicing such as filter cleaning may be needed depending on the pool filter’s performance and contaminants present in water. Don’t forget a pool safety check, walk the barrier perimeter and physically check for any non-compliance issues or further safety hazards around the pool. This is a regular pool service interval we increasingly find suits our clientele and comes highly recommended due to the extra convenience and insurance it delivers. 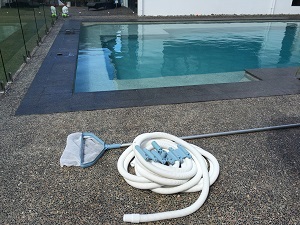 A full pool and equipment clean and service is undertaken during each visit and such regular pool service often allows for little effort by pool owners in pool maintenance, with only visual inspection and perhaps the occasional use of a leaf scoop. As with monthly service regimes, we undertake a full test of all pool water quality parameters required whether its a salt water pool, ionised or otherwise. Completely balancing your pool will ensure against nasty surprises while offering protection to swimmers and pool surfacing and equipment. Backwashing & Rinsing the pools filter may be required, however in many applications this can be done at monthly intervals. Cartridge Filters usually require more regular cleaning intervals. Cartridges must be removed for cleaning or changed with a clean spare can also be an option. Inspect the pump operation and clean the pump strainer basket to allow for optimum circulation and water balance. A performance check of chlorinator and cell, auto dosing equipment or anodes will help dictate adjustments to output or timer settings, key for delivering optimum pool water quality. A full brush down of pool surfaces and vacuum of all areas, followed with a skim of the pool to remove any remaining particles not only produces a sparkling clean pool but prevents against pool stains and algae formation. Cleaning and service of auto cleaning equipment must not be forgotten as failure to do so can affect functionality of not only the cleaner, but other pool operational equipment. A careful check of pool safety compliance should always be included in a regular pool service. Monthly pool servicing year round is recommended as the minimum interval to pool owners. Pool Clear has no lock contract to our customers and occasionally for pools with minimal usage, protected from contaminants, out of season or simply by client request, maintenance intervals can be stretched to 6 weeks or more. However the longer the interval of a regular pool service, so the risk of equipment failure and pool infestation increases. 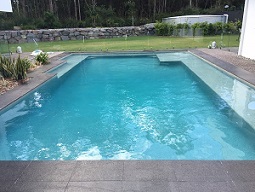 Any regular pool service should include all tasks, as set out in fortnightly regime, however typically a monthly service will require higher amounts of balancing additives, backwashing and rinsing of filters and more cleaning labour. A Monthly pool service also increases the amount of inspection, cleaning and maintenance required by pool owners or tenants in between service visits. Unfortunately many are unaware what is required to keep a healthy clean pool and simply having a monthly service performed alone, will not insure against expensive clean ups or equipment failure in the interim. Pool Clear does its best to provide advice and training to those in need, and responds immediately to our regular clients in an emergency. During Pool Clear’s monthly pool service, your pool will receive the works treatment, tailored to each individual pool, customer and safety requirements. Periods of heavy rainfall or windy conditions can adversely affect the pool water balance and inturn cause pool problems. High rainfall will dilute the pool water and can introduce run-off and flooding issues. Increasing the runtime and or output of pool sanitiser equipment can compensate for sanitizer dilution or adding sanitizer directly to pool is also an option. Conduct a water test following such events and re-adjust all parameters as required. Windy weather often introduces extra litter and contaminants and this will also affect water balance. Remove all items from the pool as soon as possible, including toys and any litter as they can increase risk of algae formation and stains. When cleaning a pool, pay particular attention to corners or areas of poor circulation in the pool, as this is where algae and stains will first appear. Ensure the correct quality equipment is installed in your pool, for it will be virtually impossible to maintain a healthy pool if the pool equipment falls short.